Heavy duty hauling requires a heavy duty hand pallet truck. 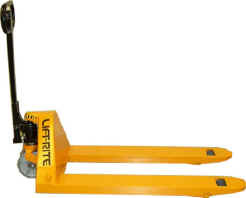 Lift-Rite's ® high capacity pallet truck (also known as a pallet jack) is ideal for extreme load lifting. At 8,000 pound capacities, these pallet trucks are built with reinforced frames, heavy duty pumps, an solid steel wheels and rollers. Lift-Rite® High Capacity Hand Pallet Trucks can handle your heavy lifting. Please call 1-888-778-5438 for pricing & availability.